You are here: Home > Henna Learning Center > New to Henna? Get Started Here! Welcome to the wonderful world of henna! I want to make your transition from henna beginner to henna artist easy. Henna is not something to stress over and there is no need to get anything perfect. Relax and be ready to try new things on your journey! Henna is infused with positive healing energies and, if you allow yourself to connect with those energies, you will feel a distinct uplift in your mood when you are working with henna or when you have henna stain on your skin. When you are new to henna, it's possible to get overwhelmed with the possibilities. Don't worry! Henna is like cooking. You continue to learn and improve, and it just keeps getting better! Henna is a plant, lawsonia inermis, that is grown in hot dry climates. The leaves are dried, ground into a powder, and the powder is made into a paste that is used to stain the skin and to dye the hair. A seldom realized henna fact: Henna is a permanent stain. The henna does not fade away. The skin cells exfoliate off and thus "fades" the henna design. Skin typically exfoliates completely in a cycle of every 20-30 days which is why henna will always be temporary on the skin. On your white couch, however, henna will be permanent! Not all henna is created equal. Henna is a crop and like any other crop there are different qualities available and it can vary year to year. It’s important to only buy henna from a reputable company that knows what they are doing and knows how to properly store henna. We source our henna from reliable manufacturers that provide us with high quality pure unadulterated henna product. All of our henna is express shipped to us and stored properly. The ensures that you get the freshest possible product and not something that has been sitting in the belly of a hot ship for a month. Never use henna that has chemical additives or is for the hair (learn more about henna for the hair here). These products contain dangerous ingredients and should never be applied directly to the skin. Henna is NEVER black. Anything called henna that leaves a black stain and lasts more than a day or two contains para-phenylenediamine or PPD and is extremely dangerous. Safe natural henna will ALWAYS start off an orange color once the paste is removed. The tattoo will continue to cure over the following day or two darkening to a reddish/brownish hue depending on a number of factors (listed below). The stain will have good color 5-10 days and be completely gone in 1-3 weeks. At the bottom of this page, you can see some pictures of the stain progression! Be sure to read our Henna Safety Page here. What Kind of henna is best for you? When deciding what kind of henna is best for you, think about what are you trying to accomplish with henna. Are you looking for a fun thing to do once or twice? Do you want to develop your henna interest as an ongoing hobby? Do you want to start a henna business and do henna on others? We offer henna in both powder and pre-mixed paste. Mixing your own henna paste from our professional grade henna powders will give you the best possible stains . If you are not interested in learning to mix your own paste, our pre-mixed henna paste is a great alternative. Think of it as the difference between making your own marinara sauce from fresh tomatoes or using a jar of Ragu pasta sauce. They both work, but there is a big difference in the final results. I highly recommend learning to mix your own henna. This is the real deal! There is nothing like mixing your own henna from scratch and tweaking it to exactly how you like it. Our professional grade powder henna is capable of spectacular results. If you are charging others to henna them, you should be mixing your own henna. You can learn more about the different types of powder henna we offer here. Mixing henna is pretty simple. All you need is lemon juice, sugar, and essential oils. Our henna comes with complete easy-to-understand mixing instructions. It’s really inexpensive too! Once you get your basic henna tools together (that’s why I’ve created these great henna kits for you), you only have to reorder the henna itself which is cheap! You can get our basic refill kit that contains 100 grams of henna plus essential oils for only $15.99. This will easily give you 75-200 henna tattoos. It’s common for experienced experienced artists to get well over 300 henna designs out of 100 grams of henna. If it were up to me, everyone would mix their own henna! You could say I’m a mix-your-own-henna-activist! However, I understand that mixing henna is not right for everyone, and that’s why we offer a quality pre-mixed henna product that is ready to use. Looking for fun, easy, short term results from your henna? Pre-mixed paste is for you. Our pre-mixed henna cones are ready to use with no mixing required. These leave good color, but are not capable of the extra deep color and long lasting results you can achieve from mixing your own henna. Our ready made henna cones are great if you are using henna as a one-time thing or if you have no interest in mixing your own henna. They are very popular for one-time fundraisers and other one-time events. Our ready made henna paste is made especially for us and express shipped frozen. As soon as it arrives, it’s checked for quality and stored in our in-house freezers. I do a weekly spot check with our henna cones. We put serious effort into offering a ready-to-use henna paste that is as fresh as possible while still containing all natural ingredients and absolutely no harmful chemicals. Getting good henna color is easy once you understand the "whys" behind the rules. There are many things that will effect the results of your henna. Below are the major factors to consider. Keeping these in mind while doing henna, will help you get the best possible henna stain. The cleanliness of the skin being tattooed. Oils, lotions, sun block, and sweat are all barriers that will prevent the henna from staining as darkly as it could. Self tanner can cause issues with henna stains. The part of the body being hennaed. Thicker skin stains better than thinner skin. Generally, you can assume palms of the hands and soles of the feet stain the best and the further away from these areas you get, the lighter the henna tattoo stain. How long the moist henna is in contact with the skin. The longer you leave the henna paste on the skin, the darker and longer lasting your color, because it stains more layers of skin cells. As the skin cells exfoliate away, there are still layers of stained skin below them. This is why your tattoo will stay much longer if you leave the paste on longer. I suggest a minimum of 4 hours of skin contact with the henna paste. Body temperature is a HUGE factor in releasing henna dye. People with higher body temperature typically get better stains. When you are warm, your skin cells expand because they are trying to release heat. When you are cold, they contract because they are trying to hold in heat. This means when you are warm there is more surface area to stain and more room for the dye in the henna molecules to penetrate the skin cells. How the dried henna is removed. Do NOT use water when removing the dried henna paste. The paste should be scraped off and any stubborn bits can be removed using olive oil. Avoid water for as long as practical. How well you care for the henna tattoo. Water should be avoided for as long as possible (24 hours is the goal, but not possible most of the time). Avoid anything that will exfoliate the skin (chlorinated water, salt water, household cleaners, face wash, smoothing lotions). The henna mix that was used. Fresh mixed henna will leave better longer lasting color than pre-mixed henna. Play with your henna recipe to find what works best for you. Keep in mind that you must allow sufficient time for the henna to release it's dye when you mix your own henna. It takes time for the color to come up! Remember, after the henna paste is removed, the henna is not at its full color. It will continue to cure in your skin releasing dye molecules for 24-72 hours after henna paste removal. These pictures are of henna on me using ORa henna and the Super Simple henna recipe using 100 grams of henna and 1 ounce of essential oil. The henna was left on for 2 hours with no sealer or added heat. Leaving the henna on longer and adding a sealer/wrap can yield darker longer lasting color. Nothing special was done in between these pictures. This is the natural oxidation process of a henna stain. Believe me, if I can get this kind of color easily, so can you. 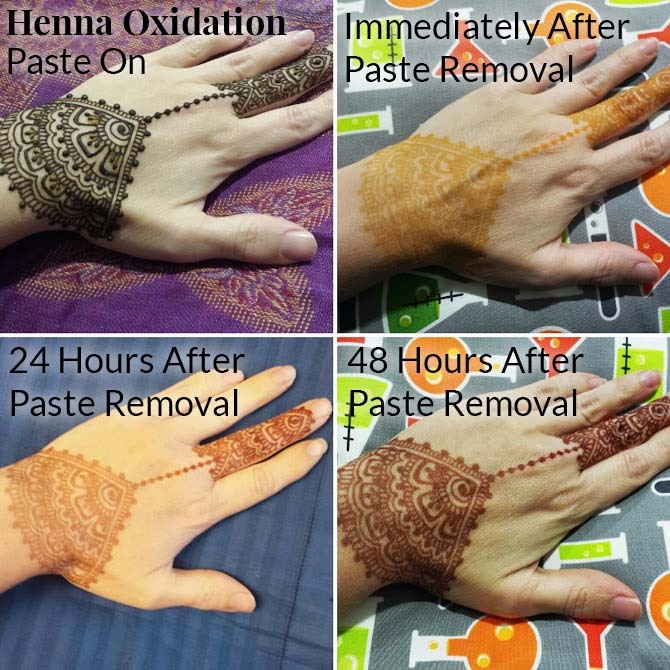 Download & Print "How to Get Extra Dark Color Henna Tattoos "